The box arrived by mail on an afternoon in late September. I rushed out the front door, late for an appointment, only to be halted by a big cardboard carton on my doorstep. Hoping to deal with unpacking its contents later, I tried to push it aside with my foot. To my surprise, it didn’t budge. I toppled over, spilling my mug of peppermint tea all over it. Oh, yeah, it’s the saffron, I thought—15,000 corms of Crocus sativus to be exact. I fell in love with saffron about two years ago—and probably long before that considering how much I crave Spanish, Indian, and other foods containing ample amounts of this delicious spice. I have been growing and studying plants professionally for more than 17 years with a persisting tangent into the tea and botanical beauty industry for the past 8 years. One winter, I read up on the medicinal benefits of saffron and learned that saffron, when applied topically, has positive health effects on the skin and hair with circulatory and antioxidant benefits. Being a plant person first and a beauty person second, I felt the inevitable pull we gardeners feel to try something new. And secretly I hoped to incorporate saffron into the ingredients for my skincare line. Saffron originated in Persia (Iran) and grows well just about everywhere in the world. 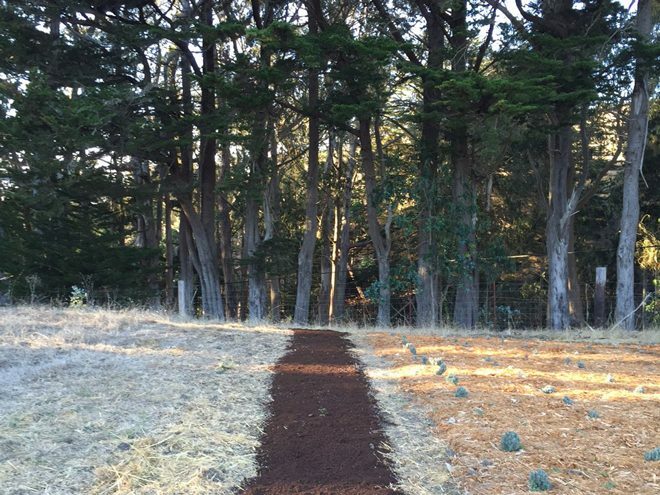 After a successful growing trial, I decided to take the plunge and produce a crop on my farm in Half Moon Bay, California. 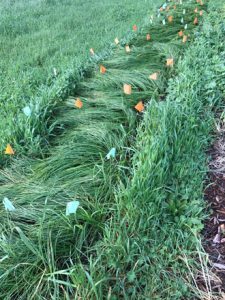 I run my farm using sustainable but sometimes challenging dry farming techniques that rely on organic amendments, cover crops, and natural rainfall. The plants don’t like extreme cold or too much water, so my sunny coastal California farm is a good fit. As I mentioned, the corms arrived in September and were immediately planted two and a half to four inches deep in well-prepared soil in full sun. About four weeks later I saw signs of the plant’s green, spiky foliage emerging from the soil. The first flowers appeared about one and a half weeks later. 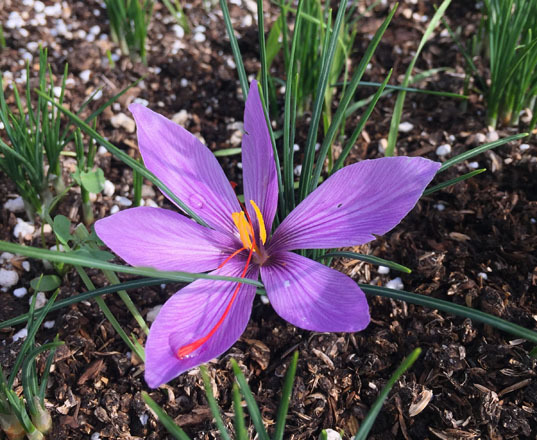 You have to be sure to pay attention to saffron, as you want to harvest the small purple flowers the first or second day after blooming, to be sure to get the healthiest stigmas, or threads. 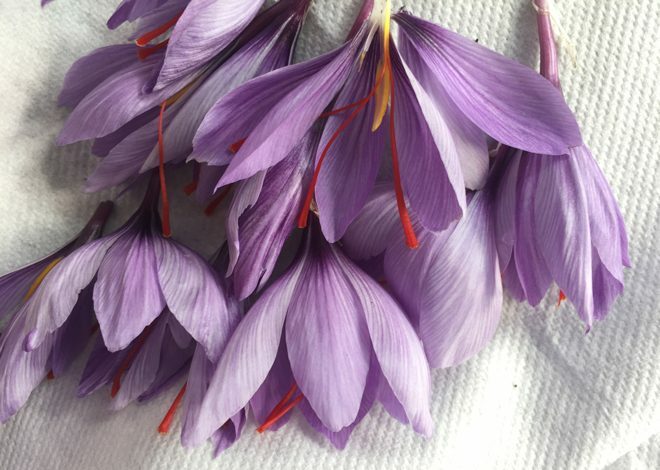 For three solid weeks that November I checked my saffron crop twice a day, every day. Missing one flower felt like missing a million dollars, and when slugs started to attack, I practically slept between the rows to fend them off. 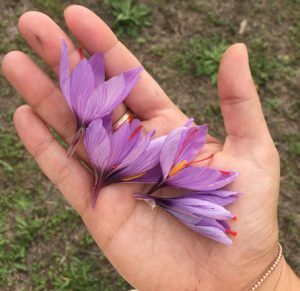 I harvested those 15,000 saffron plants—alone. But that’s gardening for you. You get obsessed with growing something and you go deep down the rabbit hole (or gopher hole in my neck of the woods). The entire crop was harvested within eight weeks of planting. After harvest, the foliage continued to grow and matured into a lush, dark green carpet. In January, when the plants went dormant, the leaves yellowed and died back. The corms remain in the ground undisturbed between growing seasons. To grow your own crop of saffron, plant corms in late summer in the ground or in a terra cotta container. Water well—or wait for fall rains—and watch for new growth to emerge. Saffron stigmas dry well, so you can grow a large crop and harvest the threads for later or to share with friends. To use your saffron, soak threads in warm water to make a saffron broth to use in your recipe. This draws out the medicinal benefits and allows your saffron to go further. Some of my favorite ways to use saffron are in teas, mixed with vanilla ice cream (yes, it’s amazing), in scrambled eggs, or in the traditional Persian burnt rice dish called tahdig. Despite gophers and severe drought, my saffron crop actually thrived and produced a bumper crop of those famous red threads on each purple flower. Create a rich broth by soaking a couple of saffron threads in 6 fluid ounces of warm or hot water for 24 hours. In a mixing bowl, whisk two eggs together with a pinch of sea salt, black pepper, and a generous pinch of paprika until combined, taking care to not leave the spices along the edge of the bowl. Pour the mixture into a well-buttered pan over medium heat and allow it to warm for about 15 to 20 seconds. Add roughly 1 tablespoon of saffron broth to the eggs in the pan, and gently stir as you would normally scrambled eggs until they are fluffy and are about 85 percent cooked but still moist. Remove from heat. Serve immediately garnished with a fresh clipping of rosemary.